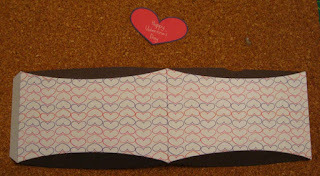 Here's another quick valentine's day project for you! This one is super easy and fast! It's a cute little Valentine's Day pillow box. Just cut around the edge of the box, fold the bottom and top on the slightly curved line, fold the tab and use double sided tape to close the box. 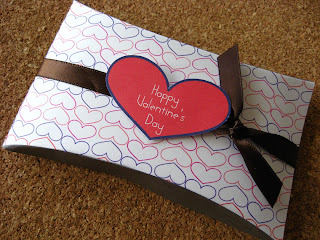 Tie a ribbon around the box, and use foam tape to adhere your sentiment onto the front! You're done! They'll fit a few candies, or a cookie! Yum! Great project. Thanks so much! Awesome Valentines Day pillow box... Great job!! You have the best skills... especially with whatever you use to design all this stuff. I AM IN NEED OF HELP! I thought you did a post of quick print-outs to put on candy heart boxes. I can't find them on your blog, so now I'm sure I was hallucinating. It just screamed "Schlosser." I've been craft-blog surfing all evening looking for it! Any thoughts? Or templates :)? Still, I think you could do something like this too, especially with that diamond Stickles stuff as embellishment. I love that. This is awesome! 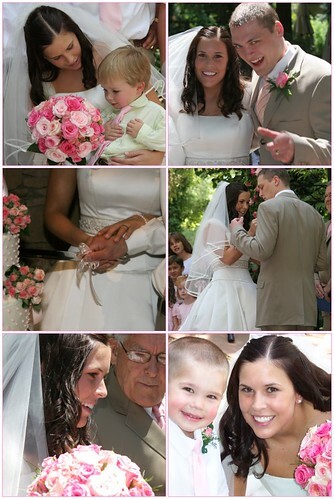 Thanks so much for sharing, I'll be linking. Love this tutorial thank you so much for this. Keep up the good work. Want to make sure you get every post?